How to count calories in meals. P.S: I broke down the "Calorie" posts into 2 different posts, so it wont be too long a read for you. The second part will highlight how many calories needed daily and exercise etc. I will try to make the posts very easy to understand. 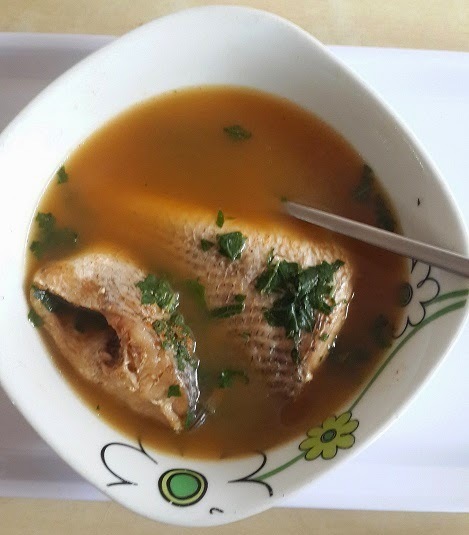 This fish pepper soup contains about 215 calories. 2 pieces of Croaker fish 150g (take into consideration that this fish is lean, means less oil) 200 calories. The scent leaf less that a hand full: Very insignificant. But lets dash it 5 calories. Chili Pepper: 5 calories. I used about 1 tbsp (17 calories) for the whole pot which is like 4 times this plate. When cooking, write down or take note of the quantity of each ingredient you use, this will help you derive the calorie content per plate. Always divide into how many plates its serves, that way you can determine each plate. I hope its not confusing? Please ask your questions in the comments later. The whole pot served 5 to 6 people. 1/2 cup iru(locus beans): About 50 calories. Total calories in a pot: 1695 calories. When divided into a plate it comes to about: 183 calories. I didnt divide the whole pot by 5 equal parts because that isnt exactly what is on my plate. If i did, i would have 3 pieces of titus fish and more soup. But, in a case where you do dish food into equal parts, please divide accordingly. Kapish? Lol! So when I add my semo which is about a 100g dry meal= 330 calories. I divided the cooked semo into 2. So my semo meal was about 165 calories. That's exactly my fist size. This whole meal came to about 348 calories on my plate. Calories in some dry foods are not the same when cooked. Note this when using google. Counting calories in meals is not something you learn in 1 day, it will take time, google is your friend. I would say again that you need a jotter dedicated to your meals. This will help you understand your eating pattern, calories in your daily meals and how much you eat daily in total. This will speed up your weight loss by 50%, you have an edge over those that don't do this trust me. It is very important. Remember, cook as many of your meals as you can. Leave the rest for those stressful days at work where you have no choice but to eat out. Please feel free to ask your questions below. Luv ya! My dear odiro easy, I seerrriiouussllyy... started a food journal weeks back. don't know where the book is right now. Welldone dear.... you're too much.